Thank you for also stopping by to read this page. 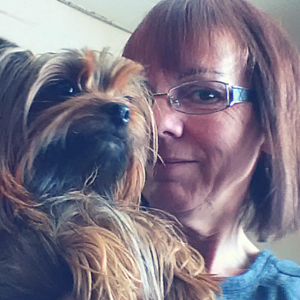 I’m Sheri, and Bella is my best friend who just happens to be a Yorkie. When I first got Bella, I thought it was love at first sight. I thought about all of the wonderful things we could do and learn together. I was ready to have the perfect Yorkie..and I did…for about a minute. That’s when I realized that I had to train her if I wanted to have a well-behaved companion. Long story short, through many mess-ups and not knowing what I was doing, I was able to figure out a few things. Reading, researching and studying about dog training online helped me to better understand Bella and what she was going through, and I learned even more. As I talked to other dog owners at dog parks, out and about and at dog-related forums, I realized one thing – More people could benefit from what I was learning through trial and error. That was the moment that Train That Pooch was born. The only thing that outweighs my love for all things dog training related is my love for Bella. I know how much you love your pooch and want you to have the same kinds of fun experiences and memories that Bella and I have had thus far. Please stick around the site and have a look at the many different topics and articles that we have on the various training areas. We hope you like what you see and would love to hear from you and share your stories with the rest of our readers. If you have any questions at all, please contact us and we’ll get back to you as soon as possible.